Celebrating our first successful SOL challenge where it all began. Shelley: I had heard of Slice of Life and read people’s posts weekly but didn’t think I had enough to contribute. Feeling that I “needed” to be accountable to you as we were in this together helped to motivate me to write. Krista: I felt the same way. I also couldn’t imagine having the time or energy to blog regularly. There were many moments when I felt too tired or busy to write, but knowing that it was my day to write gave me the push I needed to get it done. Krista: The challenge came at the perfect time. 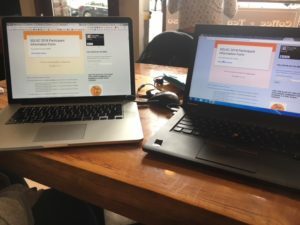 With just starting our website, Lit Coach Connection, and agreeing to take turns blogging weekly, we wouldn’t have enough content to go live until Spring. 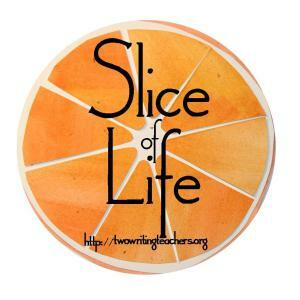 When we realized that the Slice of Life Challenge was about to begin, we saw an opportunity to increase our number of blogs and therefore help launch our site. Shelley: With only writing twice in the two months of launching the blog, it provided the nudge I needed to write often. I was afraid I would run out of ideas and as the month continued my notebook became filled with possibilities. Krista: My first blog post took days to write. I felt like a student writing a term paper and wanted everything to be just right. What changed for me was that I realized that it is okay to post first draft thinking. Shelley: That’s right! I remember reading something Pernille Ripp said about blogging. She stated that blogging for her is often her “First Draft” writing. Letting go of the restraints of having it be “perfect” allowed me to let the ideas flow and be okay with hitting submit. I reassured myself that I might revisit the piece to improve upon it at a later date. And that was okay. Signing up for the Slice of Life Challenge at our favorite coffee shop aka “our office”. Krista: One thing I discovered was that I had to write about topics that were on my mind at the moment. I never said, “I should write about X”. I had to go with what I felt like writing. On weekends I tended to write more about yoga, my children or something I heard someone say. On weekdays, my blogs were mostly about classroom practice. Shelley: There were definitely moments when the words flowed from my fingertips and when complete I was happy with the message I had to share, and other days when I felt stuck. I had to tell myself that was okay. This made me think of about the students in the classroom and their process as writers. I need to allow them the same courtesy as I did for myself. Allowing them to have the time to process their thoughts when they feel overwhelmed, and letting them know that it is okay. Krista There were days when I worried about what I would blog about next. I had to have faith that the ideas would come and they always did. Shelley: The greatest gift I feel we received was the gift of community. There are educators that I have met and feel that I have connected with through this challenge. Having the opportunity to communicate with them about our writing lives has given me the inspiration to continue to write. Krista: I agree! I so enjoyed getting to know people through their writing. We had meaningful conversations about teaching practice and life in general. This experience has given me the courage to continue writing and sharing my ideas. Shelley: It is so powerful finding like-minded educators! I can’t wait to continue the conversations on slicing Tuesdays. 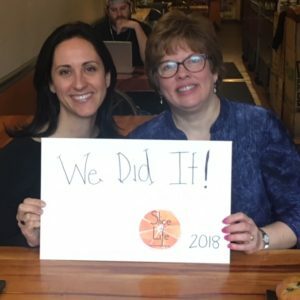 It has been a great Slice of Life 2018! I appreciate being able to read your blog. Connecting with other teachers and writers is a gift. We have enjoyed connecting with you, Karen! We will continue to post on the regularl Tuesday Slice of Life. See you there! I loved reading your posts about setting up classroom libraries. It made me wish I was still in the classroom so I could reset up my library! It is an amazing challenge! The community is the best. That is definitely our plan! It was amazing connecting with like-minded educators!